Researchers studying snowshoe hare coloration illustrate ‘science at work’ in identifying evolutionary hotspots in a warming climate. Winter comes every year, and animals have ways of adapting. Squirrels cache their nuts, and bears dig their dens. Source: Mills’ lab research video screenshot. And then there are snowshoe hares. They are one of many animals that react by changing their physical appearance. Some populations of snowshoe hares morph each winter, swapping out their summery brown coat for wintry white fur. L. Scott Mills, PhD, wildlife biology professor at the University of Montana, has studied hares for more than 20 years. Around a decade ago, he started to notice something unusual: some hares sported white winter coats even when declining snowpack left their habitat brown. “We were seeing more of these in the fall and the spring; these animals turned white, but there was no snow,” he says. Mills set out to investigate this issue, pondering what this “phenological mismatch” meant for snowshoe hares and other animals that change color based on day length, and their potential to adapt in a changing world. 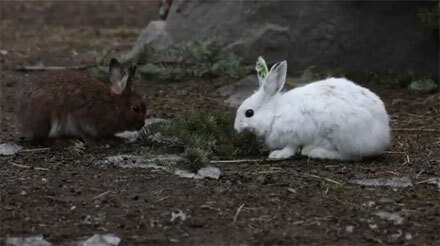 Mills and researchers from five countries studied hares and a variety of other animals that change coloration seasonally, and their study was published in a recent issue of Science. They visited 26 museums around the world, analyzing more than 2,700 specimens of eight species (including four species of hares and four carnivore species, including three types of weasels and one fox) from 60 countries. With each sample, researchers confirmed the animal was in its winter coat and recorded detailed information on where the animal was collected so they could georeference the location. The team sought to determine where the animals turned white in the winter, where they stayed brown, and where both white and brown animals overlapped. They used this information to predict what drives coat coloration and whether animals will have a white winter coat or a brown winter coat. Using complex spatial modeling, Mills found “hotspots” where animals have variable coloration during the winter. Mills says with evolution, places with the most variation evolve the fastest. He says these “hotspots for evolutionary rescue in a changing climate” may lead to increased survival rates for animals during winters with less snowfall. “By identifying the places on the ground where there are both color morphs, winter brown and winter white living together, we basically identify the special sauce areas for rapid evolutionary change,” he says. When he first began his research, Mills looked into whether animals like hares could morph their coloration like octopuses or chameleons and discovered they could not. “The timing of their coat color is pretty fixed, so they don’t have much plasticity in the timing of their color molt,” Mills says. He also studied behavioral plasticity to see if hares would change their behavior to meet a changing world, such as hiding behind brush or fleeing a predator when they were mismatched with the environment around them. However, he could find no indication of this behavior by hares in the field. Mills’ research group is continuing to do field work, studying a variety of color-changing animals out in the field, such as weasels in Montana and arctic foxes in Sweden. These animals are generally more difficult to study than snowshoe hares, because they tend to flee when people approach. Using technology like remote camera traps, the researchers record images of the animals over time, and they also collect genetic samples for analysis. These genetic samples will be used for further research. Mills notes that whether hares and other animals have a winter brown coat or a winter white coat is an inherited, genetically-determined trait. For evolution to occur, Mills says, it must have a genetic basis. He also points to evidence that evolution can happen far more quickly than scientists once thought to be the case. “Under the right conditions of large, connected populations, reducing other stressors, we do know it’s possible for meaningful evolutionary change to happen on the order of a handful of generations, one or two handfuls of generations as opposed to hundreds,” he says. Another question Mills and his team hope to answer: How do these characteristics affect the predators that prey on hares and other color-changing species? None of the color-changing animals is a top predator, and these interactions could have meaningful trophic consequences down the line. With the predators elusive and low-density, they are difficult to study, but Mills says the research team is working to use tools like spectral imaging to see how animals may perceive mismatched prey animals. “There could be some interesting dynamics with changes in coat color that might cascade across trophic levels of coat color-changing animals,” Mills says. Editor’s note: A similar video, with additional information, is available from the Mills Lab here.